In July 2005 I saw one of my favorite bands, Rusted Root, in concert at The House of Blues at the Mandalay Bay hotel in Las Vegas. 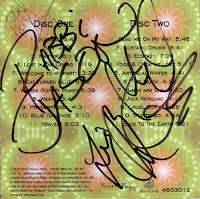 Following the show, the members of the group signed autographs and met with their fans as they usually do. 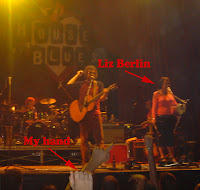 The first one to come sign autographs was Liz Berlin (in photo), one of the singers of the group. I spoke to her for a few minutes and she signed a CD insert to "Rabbi Jason." One might think that signing an autograph for a rabbi would prompt her to mention that her father is a cantor (a Conservative cantor no less). I only learned that her dad was a cantor after getting a link to an article about her on the PittsburghLive.com website. I received the link in a Google Alert because the words "Jewish Theological Seminary" appeared in the article. 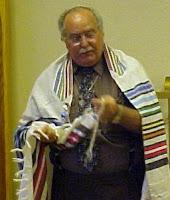 Apparently, Liz Berlin's dad, Rick Berlin, decided to attend cantorial school at the Jewish Theological Seminary in 1996. That means that we must have overlapped by a couple years since I started rabbinical school in 1998. I searched the Web for a photo of Cantor Rick Berlin (in photo) and sure enough... I remember him. He was ordained in 2000. I'm not sure if Liz Berlin is Jewish or not (mother is Mary), but in the article she is quoted as saying that she realizes her wedding ceremony to her husband, Mike Speranzo, several years after the birth of their child was "not the Christian thing or the religious thing, according to standard religious practices, as far as the dynamics of the family, to do it that way." Before she could pursue music, however, she had to convince her parents it was the right thing to do. That turned out to be surprisingly easy. 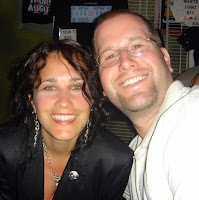 Rick and Mary Berlin attended the group's second show -- at the Graffiti Rock Challenge in 1991 -- and realized Rusted Root was not a whim or indulgence. "It was the first time we heard the band, and they'd only been together a week or so," Mary Berlin says. "Sometimes you know something is special. I knew Rusted Root was going to make it. I just knew it. I had that intuition." "She was absolutely right in dropping out," Rick Berlin says. So inspired was Berlin by his daughter's success -- he calls Liz "my hero" -- that he decided to change his career. "It was because of her willingness to take a chance that I decided to take my risk in 1996," says Rick Berlin, who shut down a business to attend the Jewish Theological Seminary in New York to become an ordained cantor. "There were risks, and it wasn't easy, but her success was one of the things that made me take that chance."